I’m actually going to make this review a little more concise and succinct than my usual reviews. I’m going to tell you about the flavors, the textures, the packaging, and of course how my love life is going right now. Wait. What? What does that have to do with NLA for her bars? NOTHING! But guess what? This is my blog I can do what I want, LOl. Oh dear. I’ve gone and lost my mind haven’t I. Sigh. Well. Let’s see what happens here. NLA For Her is one of the more common brands in the sports nutrition for women space. You know I’ve reviewed almost all of their products in the last several years, and I’ve had mixed opinions on their output. The products are not always the best-tasting- as you know from my NLA Uplift review. These are products that have worked OK for me, but not always had the best experiencing going down the old chute. So this being an edible product where taste is very prominent, I was just a little bit nervous that the NLA For Her Lean Protein bar wouldn’t be as good tasting as some of the other protein bars I reviewed. So. Were my fears confirmed? Or denied? Let me tell you. What is the Best Flavor of NLA Bar? And Does it TASTE Good? The thing that I noticed right away with NLA Lean Protein bar was that the cookie dough flavor, which is the only flavor, actually tastes nothing like cookie dough. Sigh. I know. How. How is it possible that you make a COOKIE DOUGH flavored bar that doesn’t taste like that flavor at all? I don’t know, but we should ask NLA For Her. One other thing that you have to be aware of is that as of the writing of this article, there is just ONE flavor of NLA Her Whey Lean Protein bar. That’s right. Just one. So I suppose the cookie dough IS the best flavor of NLA Her Whey Lean Protein Bar. But it’s the only one. Hm. But yeah overall these bars probably don’t crack my top ten for best-tasting protein bars on the market. The texture is fine.. they are soft and chewy almost like a combat crunch bar…but at the end of the day, there isn’t a whole lot of actual flavor in them. You get a little bit of like…spicyness almost from the artificial sweeteners, but that is constant no matter what bar you get pretty much. The other thing that I don’t love about these protein bars is that they do tend to melt at a pretty modest temperature. I had one in my car for like…not that long and the thing was just a puddle after a fifteen minute stop into the drug store. So keep that in mind as another downside of NLA Her Whey Protein bars. But. Let’s try not to be TOO negative here. There are some positives about these protein bars. Mostly the thing that I like most is that the nutrition facts and overall health profile of NLA Her Whey Bars are actually really good. Protein Blend (Whey Protein Concentrate, Whey Protein Hydrolysate, Whey Protein Isolate), Vegetable Glycerin, Milk Protein Isolate, Chicory Root Fiber, Vegetable Oils (Palm, Palm Kernel), Maltitol, Water, Sorbitol, Sugar, Coconut, Pea Protein Isolate, Almonds, Cocoa, Salt, Natural Flavors, Steviol Glycosides, Potassium Sorbate, Soy Lecithin, Peanut and Sucralose. So. Saturated fat is a touch high at 3 grams, but it’s not a deal breaker. The sugar alcohol and sugars add up to 11 grams which is also a little high… but I suppose the NLA for Her Lean Protein bars would taste like garbage without them. And. Really that’s most of what I wanted to cover as far as nutrition. They aren’t perfect but they are awfully close. Let’s move on to the packaging now. NLA for Her Bars Look Okay. The NLA products have improved their appearance over the years. From a truly awful white jar and white lid to a sleeker black jar with custom pink lid, I think they have made strides. Truth be told they probably read my review and decided to take my feedback into account. Which. Is flattering. And also the right play. 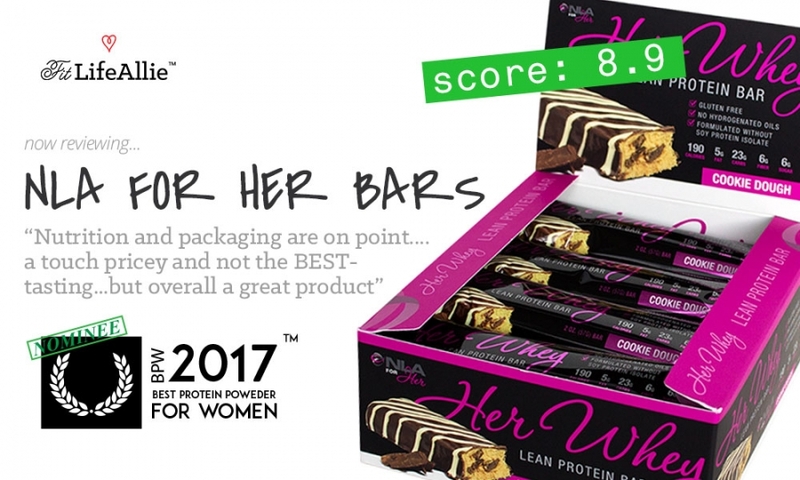 So they should take this NLA For Her Protein Bar Review into account as well, and take it to heart, and give themselves a nice pat on the back for doing a wonderful job on their bars. Are they a 10/10? No. But they are on of the more handsome protein bar packaging jobs that I’ve seen in recent history. The bars have a luxe black finish, with pink and silvery, swirly elements that bring a smile to my face and come real close to conjuring emotion in me- something NLA has never been able to do until now. I think they’ve made the most of their protein bar packaging, and positioned themselves quite nicely in an unbelievably competitive space. I give them credit for, aesthetically, a job well-done.